Mydinnertoday is all about quick, healthy, and yummy recipes. It’s only around holiday times that I make more involved recipes. A year ago, around Easter time, I got a jar of vine leaves in hopes of making stuffed vine leaves for our traditional Easter party. Well, that didn’t happen. That jar kept staring at me as it was nearing the end of its useful life and I just couldn’t bring myself to letting it die. But what can you make with vine leaves that doesn’t require you to fold the leaves one by one? 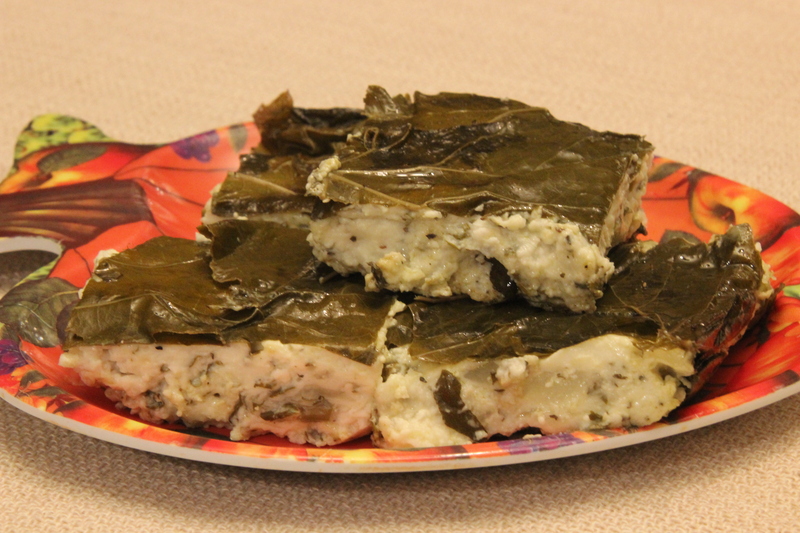 I found this recipe that uses vine leaves to fold in a refreshing yogurt filling and I went for it. How to make: If you are using vine leaves from a jar, rinse them well and pat them dry. Cover the bottom and sides of a pan with a layer of leaves. You will use the leaves of the sides to flip them over the top of the pie at the end. Brush the leaves with olive oil and sprinkle some salt and pepper. In a bowl, mix the yogurt with the dill, mint, and onions. Fold in the corn flour and add some salt and pepper to taste. Spread the yogurt mix in the pan. Cover the top with a layer of vine leaves and fold over the leaves from the sides. Cover the pan with aluminum foil and cook in pre-heated 360F/180C oven for about 40 minutes or until a knife come out clean. Enjoy this surprisingly refreshing dish that will come out of your hot oven. But let it cool first! Notes and tips: Goes without saying that as with all recipes with vine leaves, this, too, would be so much better with fresh leaves. In this case, wash them and let them stand in boiling water for couple of minutes.